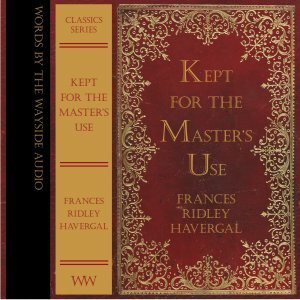 ‘Kept for the Master’s Use’ is based on Frances Ridley Havergal’s famous own hymn ‘Take My Life and Let It Be, Consecrated, Lord to Thee’. It consists of sepa­rate chapters on each couplet of that well-known hymn. Frances Ridley Havergal encourages us to take very single aspect of our life and consecrate it for the Lord's use, and we are shown very clearly that ‘He who is able and willing to take unto Himself is no less able and willing to keep for Himself’. Havergal encourages us to ‘Choose this day whom you will serve’ with real, thoroughgoing, wholehearted service, ‘and He will receive you; and you will find, as we have found, that He is such a good Master that you are satisfied with His goodness, and that you will never want to go out free’. A word about the author: Frances Ridley Havergal (1836-1879) was an English poet and hymn writer and is well known throughout the Christian world. Her hymns, poems and books have been sung and read by millions. This audio edition is published with the prayerful desire that the Blessed Spirit of God may be pleased to use it for Christ’s Glory and for the comfort, encouragement and edification of God’s people. This book is part of the Words by the Wayside ‘Classics Series’ and is beautifully read by Anita Wright.